As promised, a selection of black and white crib bedding. A quick note: it’s becoming increasingly common for manufacturers to sell bedding ‘pieces’ separately, as opposed to the typical three-piece crib set. This makes sense to me, especially as many cribs today don’t work well with bumpers (regardless of what side you take on the ever-present bumper debate). If you’re going traditional, toile is definitely my favorite way to go. There’s something very modern about this very old-fashioned textile, especially when done in high-contrast black and white. This particular set is a steal at $169.99 for 9 pieces. Although I wouldn’t normally advise using all nine at once (can you say toile overload?) it’s nice to have the comforter, bumper, sheet and crib skirt PLUS a diaper stacker, toy bag, decorative pillow and window valances. Do you love patterns? Then the Damask collection is for you. 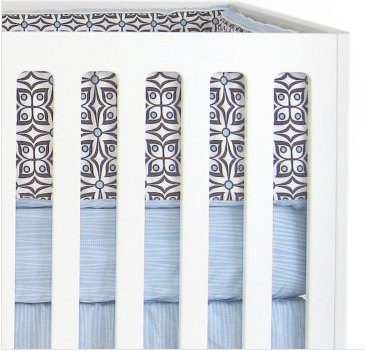 And you get a four-piece crib set for only $124.95. I really love the boldness of the contrasting fabrics in this Koolroomz design. What I’m finding, though, is that modernity of design corresponds with price for bedding. The more modern you go, the more it seems to cost. 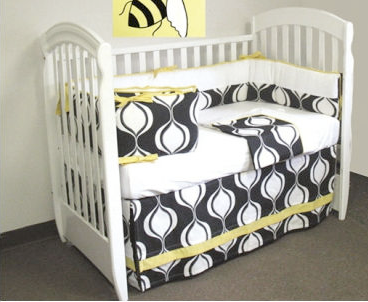 This one costs about $200 for just the crib sheet and bed skirt. And this is why I absolutely ADORE a company called Javis Davis. Turquoise Damask collection, Javis Davis, designed by me! I’ll write a longer feature about Javis Davis later. But if you’re in the market for crib bedding, and you’re in any way artistically inclined, I suggest you bookmark their site NOW. In short, JD is like having your own custom tailor or seamstress. 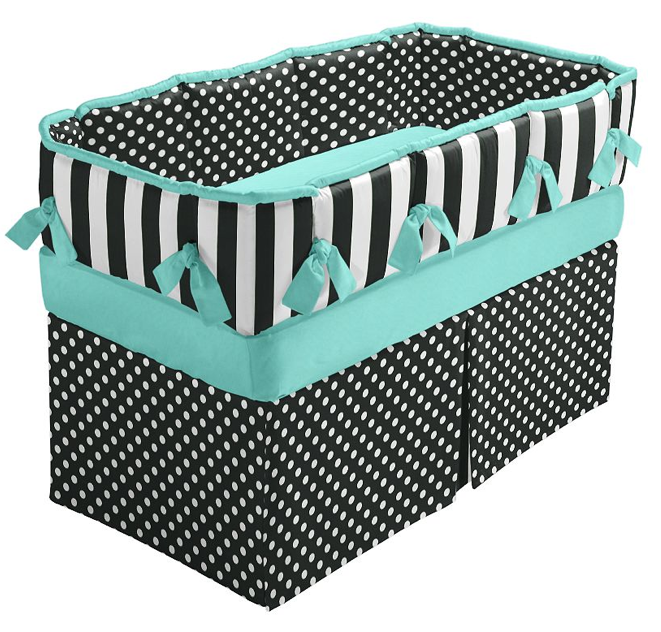 You select the type of bedding you want (crib skirt style, bumper style) and then choose a fabric ‘collection’ you like. There’s an interactive feature which lets you design your own ensemble, from bumper ties to decorative trim, and it all costs around $250. Personally, I prefer adding a contrast/accent color to the simple black and white palette. It lends character to the decor while also making the rest of your room much easier to decorate. And this leads me to the final two bedding options, both at the modern end of the spectrum and both crazy-expensive. They’re both available at CSN shops (an online mega-retailer). I’ve bought quite a few things from CSN and only have good things to say about them. The four-piece set costs $380. That’s a lot of money. My favorite. The most expensive. The bad news? $455 for the three-piece set. The good news? You can buy the sheet for $25 and the fabric by the yard (at $29 a yard). Get the sheet, have the crib skirt made. That’s really all you need.